I hope you are well and I am looking forward to catching up with you at the weekend. Today I am doing the hard yards with research into M. Borremans, a contemporary Belgian painter. “I try to draw from time to time. But somehow I’m losing interest in it. My sight is getting worse. I never buy paper; I work on found paper that doesn’t look too artistic. I like to work on a piece of paper that has a history that I don’t know.” M. Borremans. In his paintings Borremans invariably has a shallow picture space and he himself said in an interview with Maggie Grey (1) ‘I tend to leave some canvas visible, either by scraping off paint with a knife, or by using transparent paint, or by leaving some canvas open, I want to make it clear that it’s an illusion.’ This is a way of maintaining the flat two dimensionality of the picture space in what are very three dimensional figures. Borremans cites Manet, Vermeer and Velasquez as the giants upon whose shoulders he stands and while the connection with Monet are readily apparent in the images of his paintings on the internet I would probably need to see some of his work in the flesh to make the other comparisons. In his drawings, however, Borremans totally juggles the second and third dimension, the prepatory drawings, which according to Borremans could take up to a year to complete, have a playfulness that is difficult to describe. 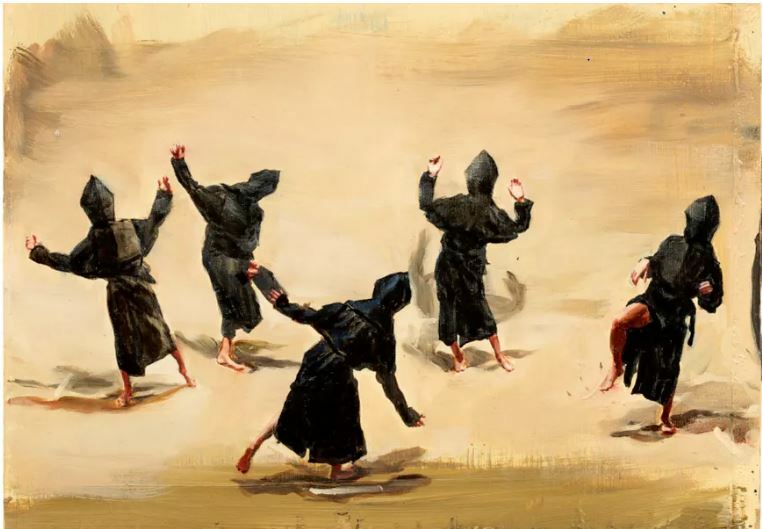 There are two scholarly papers one by Stefan Beys (10) and another by Jennifer Higge (8) describing Borremans process which are well worth reading for their insight into the painterly process, but by far the most interesting is the documentary A Knife in the Eye (17) where Borremans discusses his own process.